ASEAN+3 Bond Market Guide is a comprehensive explanation of the region�s bond markets. It provides various information such as the history, legal and regulatory framework, speciic characteristics of the market, trading and transaction including settlement systems, and other relevant information. 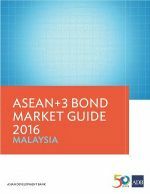 The Bond Market Guide 2016 for Malaysia is an outcome of the strong support and kind contributions of ASEAN+3 Bond Market Forum members and experts, particularly from Malaysia. The report should be recognized as a collective good to support bond market development among ASEAN+3 members. Total local currency bonds outstanding in Malaysia reached MYR1,401 billion (USD339 billion) at the end of the fourth quarter of 2018, registering increases of 1.6% quarter-on-quarter (q-o-q)�and 8.9% year-on-year. Total sukuk (Islamic bonds) amounted to MYR843 billion at the end of December, or the equivalent of 60.2% of LCY bonds outstanding, on growth of 2.1% q-o-q and 11.3% year-on-year. Corporates were active in the LCY bond market in the fourth quarter of 2018, with issuances amounting to MYR43 billion on growth of 22.6% q-o-q.